This essay originally appeared—thanks to the gracious Heidi MacDonald—on The Beat: The News Blog of Comics Culture on March 1, 2016. I am posting it here with minor edits as the first installment of what I hope will be a long series of brief essays on comics history and culture. The business of early comic book publishing in the US is something of a black box: too little data about actual practices, too many secrets in the name of competition, and too much self-aggrandizement in lieu of actual information. What we do know is kludged together lovingly by a small army of devoted comics historians from oral histories of aging comics pros, scant extant company records, occasional legal proceedings, notices in trade publications, and similar bits. It’s a documentary amuse-bouche, but one seemingly without the promise of a main course. Last year in the course of doing some research on comics readership, I stumbled across an interesting work that, while not providing a main course, perhaps at least gets us closer to an entrée. David McKay Company was a Philadelphia-based publisher, founded in the 1880s. McKay published eclectic materials from the complete works of Shakespeare, detective fiction, and children’s books alongside titles on home economics, animal care and parlor games. In the early 1930s, McKay issued a handful of hardcover comics reprints including Mickey Mouse and Popeye. By the mid-1930s, McKay had brokered a deal with King Features Syndicate to repackage their newspaper comics—Katzenjammer Kids, Blondie, The Phantom, and other titles—as floppies. These reprints were published under three titles, Ace Comics, King Comics, and Magic Comics. The first two ran for more than 150 issues each with Magic making it for more than 120 issues. 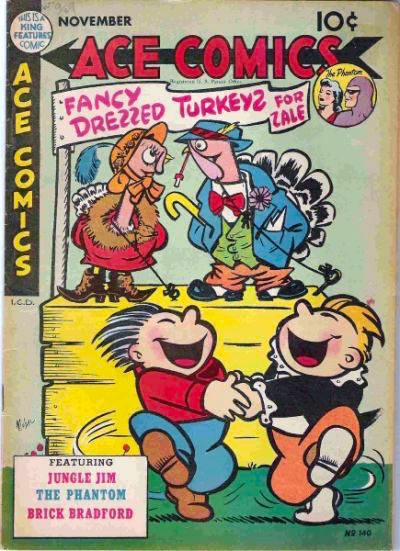 Feature Book, another McKay comics title, accumulated more than 50 issues; unlike its siblings, each issue of Feature included stories from a single property. Cridland served on the naval destroyer USS Madison for at least part of World War II, and then in 1946, he took on oversight of the comics business at McKay in addition to his regular position as treasurer. 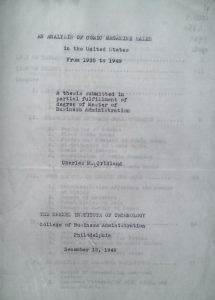 Sometime around 1947 when Drexel Institute of Technology (now Drexel University) launched a part-time evening program leading to a Master of Business Administration, Cridland enrolled. He deposited an original 115-page typewritten thesis titled An Analysis of Comic Magazine Sales in the United States from 1935 to 1949 in December 1949. In winter 2015, after finding it in a list of search results and requesting it through interlibrary loan, I got to read it. The title page from Cridland’s dissertation. The main problems facing each publisher are first, to set print orders for each issue so that there are sufficient copies for adequate distribution and at the same time to keep returns of unsold copies to a minimum. Second, each publisher must decide on the advisability of of adding new titles and of discontinuing old ones. For the industry these two problems have existed since the end of the war and have become increasingly pressing. Excessive returns due to unbalanced production have been increasing. In turn there appear to be too many different titles (pp. 1-2).